Happy Halloween one and all, as we celebrate another day of ghouls, ghosts, candy and white National Hockey League players dressing up as famous black men. Your 2012 addition to this annual tradition: Tyler Bozak, center for the Toronto Maple Leafs, who had this picture on Instagram for a few moments before deleting it on Tuesday night (but not before the nimble fingers of Wrap Around Curl capped it). Go figure: a center with no pop, dressing as the King of it. 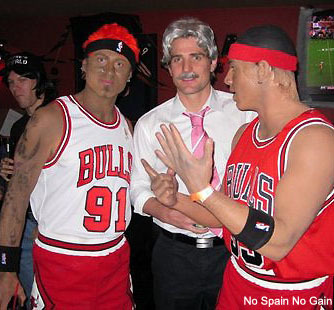 Bozak joins previous NHLers that dabbled in blackface on Halloween such as Adam Burish and Patrick Kane, who attended a 2009 Halloween party as Dennis Rodman and Scottie Pippen; and Raffi Torres, who attended a Phoenix Coyotes Halloween soirée as Jay-Z while his wife was Beyonce. That's a tribute to one of my fave artists. For anyone saying its racist is crazy! "Bozie are you OK? Bozie are you OK? Are you OK, Bozie …"
Your truly, pudgy white boy from the Jersey suburbs, thought the backlash against the Blackhawks was manufactured outrage. Harrison Mooney, black guy from B.C., didn't believe Raffi Torres was racist but did believe that his costume was racially insensitive and thoughtless. 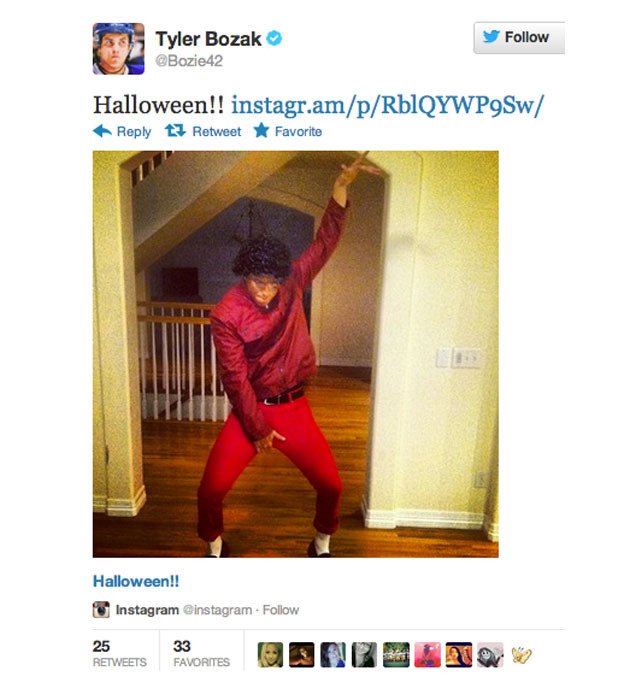 UPDATE:As was pointed out by a few readers, this isn't Bozak's first dabbling the dark arts of blackface, having previous been a Jamaican bobsledder. Cool runnings, mon.